We recently purchased a new couch. And by “new” I mean used, because I’m kind of cheap. But I also want things to look like I spent a lot more, right? So I updated the look with some beautiful wooden feet from Osborne Wood Products. Those dark feet just were not doing it for me. They made it all feel a bit too heavy. The lighter feet brighten the space and feel more modern, even while the mission style design has a timeless quality. And the best part is that it was a really simple change. 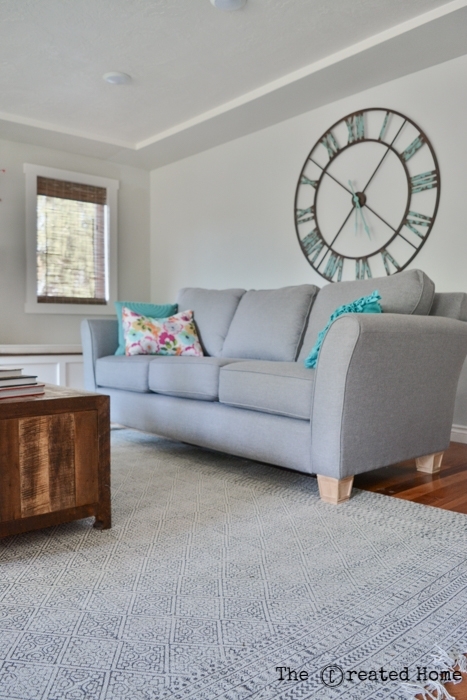 I’m going to walk you through how we changed these sofa feet out, but keep in mind that you can do this with pretty well any style. Whether your vibe is Queen Anne or midcentury, this is a great way to quickly change the look of a piece of furniture. Osborne has a great selection of furniture feet (and legs, and corbels, and posts, etc), so be sure to check them out. While they were kind enough to provide the legs for this project so I could show you how easy it is to update a look, all opinions and whatnot are my own. *Some affiliate links are provided for your convenience and to pay a little loose change toward my home decor addiction expensive saw blades kids’ Lego fund. You can learn more about affiliate links here. This tutorial assumes you have the basic threaded rod/screw setup for your couch feet, which means the legs have a screw that threads right into the frame of the couch. It’s possible to change other feet styles as well, but this is what we have and it is pretty common. Remove the old feet by unscrewing them. Use vice grips to unscrew the hanger bolt from the foot. Cross your fingers that it’s not glued in place. If you have to purchase new hanger bolts, no worries. They are available on Amazon or at your local hardware store. Drill the hole for the hanger bolts in the new feet. Use a straight edge to mark center, and drill using a drill press. If you do not have a drill press, this mobile version by Milescraft works well. I have used it on multiple projects, and it’s been great. Don’t freehand this. I know some of you are sitting there thinking, “Geesh, is she just trying to make a few pennies off of me because I don’t have a freaking drill press?! Nope, it’s just a fact of life that drilling straight holes is harder than it really should be. And straight is key to getting these feet on right. The drill bit size depends on what came out of your sofa’s old feet. Your goal is to go a bit small. I used a 17/64″ bit, which I arrived at after trying about three others and gradually working my way up until the hanger bolt would fit very tightly (too tight to screw in by hand). Screw in the hanger bolt. This was really hard to do, so I used the drill press to get it a bit of oomph. The press got the bolt in most of the way, then stopped. We tightened a couple by hand, but mostly we found that this was enough to thread the feet into the sofa. Screw the new feet onto the couch. That’s all there is to it! Of course you can finish the feet however you like. I used a very small amount of dark wax to emphasize the grain just a little bit. What I love about this project is that it allows you to create the look you want, sort of like a customizable sofa. Osborne has these feet (and all of their other products) available in a range of wood choices. For this I went with hickory, both because I like the look of the wood and because it’s a really hard wood that should hold up well over time.